Since I just love how white denim can instantly brighten up an outfit, I've decided to give white jeans another go this season. Fingers crossed I don't end up ruining these in some unfortunate messy food accident! P.S. Thanks to the team at Pink Pearl PR for the recent Fashion Friday feature! Be sure to check out my interview to learn a bit more about me and this blog. Clumsiness keeps me away from wearing white jeans too, but one of these days, I'll work up the courage. Your jeans look great on you. And the boots are nice too. I always refrain from wearing white because I think i'm going to mess it up! I really love your outfit though! Love the gorgeous look ! 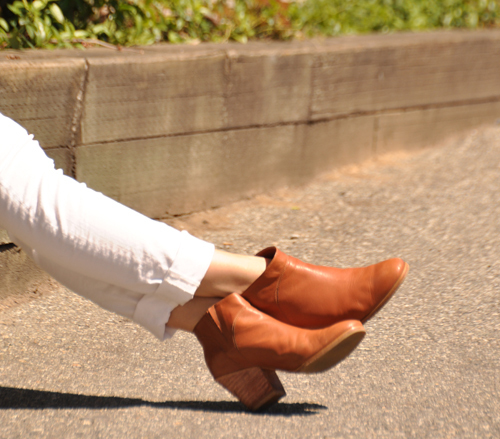 I love a good pair of white denim! Loved the article as well - it was great to learn a bit more about you. I had no idea you're a lawyer! How cool! Cute look. I love white denim as well! I am including it in my new series 4 days 4 ways... check it out if you get a chance! I love white jeans but yes, they are so hard to keep clean. I have 2 little ones and I don't dare wear white around them. Love this look! Love this outfit doll! You look great! Love the striped shirt and also your bag! It's gorgeous. TOTALLY A-DORE!!! Lovin' the jacket mixed with those stripes and fresh white bottoms! If only they could stay new looking forever! perfect <3 i love the boots!!! Ha ha ha, I definitely know what you mean about ruining white pieces. I have so many mysterious stains on my white clothes and have no idea where they came from. You look great in white! Oh God, white jeans will never stay white with me! I will be too paranoid to sit down on anything! This makes me want to break out those boots again!